Results from our air pollution kits and letters to local MPs were discussed – both Richard and Beatrice have sent letters to their MPs and Beatrice has offered to send her letter more widely if this would not duplicate other peoples’ letters. It was agreed to ask her to do so. Shaun agreed to send our air pollution results to the Sheffield Star which resulted in this article. 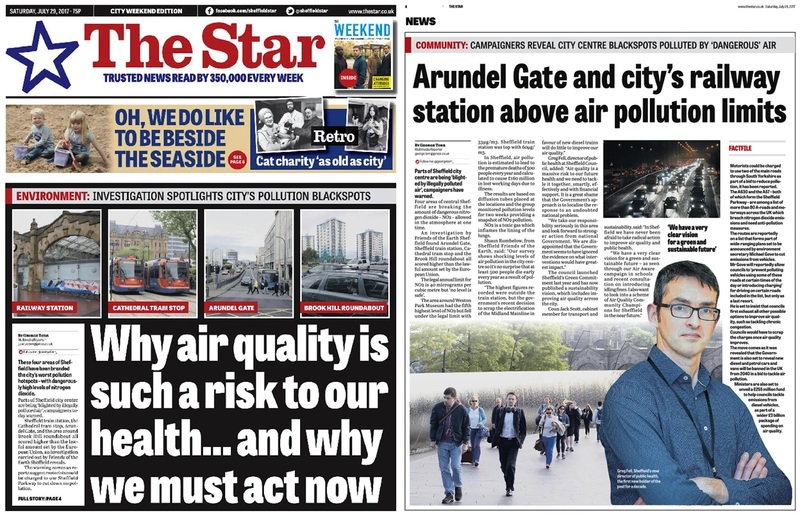 It was then used in conjunction with a press release from Sheffield City Council to form a front page and a page 4 article on Saturday 29th July. The council’s current strategy and plans (including fining drivers for idling engines outside schools) was discussed and ways of raising public awareness to create more pressure for effective action. To comment see the link. We also discussed having contact numbers for the website for members who are happy to speak to media on different topics depending on their expertise. This was due to being contacted by Sky News and not being able to contact people quickly enough. Beatrice to be asked to send letter to all Sheffield MPs. Shaun to send pres release to The Star. Members to asked to volunteer if they are happy to be named as media contacts.